and I’m going humanoid over you! Inspiration for humanity can originate from the most unlikely of sources, such as in the case of “Return To the Planet of the Apes” (created by none other than the creators of the Pink Panther! 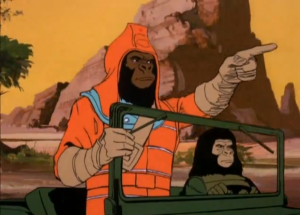 ), the short lived 1975 cartoon series based on the popular Planet of the Apes film franchise, which had been based on the novel by Pierre Boulle. The intense and colorful opening sequence, a montage of stills and it’s accompanying theme stand as a strangely moving yet completely forgotten and never appreciated work of 70′s pop art. 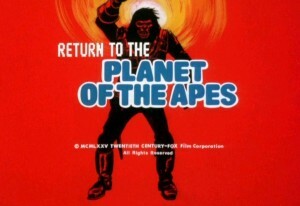 The premise of RTTPOTA is familiar territory. This time, three astronauts: Bill Hudson, Jeff Allen, and Judy Franklin get trapped in the future where mankind has destroyed itself, and the apes have taken over. The astronauts spend the majority of the episodes trying to protect the remaining primitive humans, and lead them out of the caves and on a long treacherous journey to “New Valley,” a supposed place of safety where they can “build pueblos the way the Indians did in New Mexico and Arizona.” All the while, they must stay ahead of, outsmart and sometimes fend off attacks from the apes and their cunning and determined, “General Urko”. Oh and that General Urko, what a character! He is portrayed as something of a belligerent, bumbling fool, but in reality he is incredibly intuitive and nearly always correct in his suspicions of what his enemies are up to. 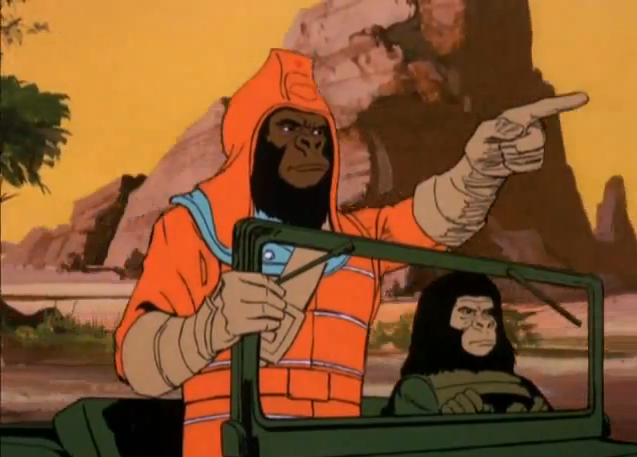 Occasionally the humans must venture into Ape City to seek the help of ape scientists and “simiantarians” Cornelius and Zira, the only apes not openly hostile toward the humanoids. Whatever happened to those modest, 70′s sideburn sporting, turtleneck wearing, medallion rocking, poetry reading, black American men who spoke the king’s English and everything. Oh how I want them back. Sadly, many were apparently subsequently replaced by all the gangsters, hip hoppers, and belligerent ‘hoot and hollerers’. Though something along these lines could probably be said to relate to all humanity. White culture(whatever that is) has certainly taken a nosedive since the 70′s as well. I just wish there were more men out there like Bill Hudson and Jeff Allen. Let me be the first to nominate Austin Stoker for president! I would even risk the possibility of getting jury duty to vote for him. While the creators of “The Pink Panther” won an Oscar for “The Pink Phink” in 1964, “Return to the Planet of the Apes” was cancelled after a mere 13 episodes. It barely registers as even a blip on the historical map of American pop culture, and is critically remembered negatively, if at all. …worthy of an academape award.